Thabi Leoka started her career as an Economist at Investec Asset Management where she was a pan-Africa economist for the Africa Fund. She then joined the Emerging Markets team in London. She has also worked at Barclays Capital (London) as an emerging markets economist, and her coverage has included Brazil and Central Europe as well as a number of African countries. Thabi was head hunted by Standard Bank and moved back to South Africa at the end of 2011 to head up Standard Bank’s research team. 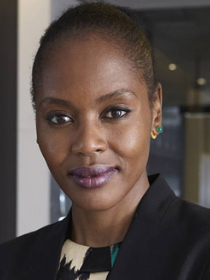 She has also worked as the Chief Economist of Renaissance Capital, South Africa. Thabi is currently an independent economic strategist and conference speaker with a passion for understanding the intricacies of economics. She shares insights on how to drive economic growth on the continent – she believes education is the gateway to success and hopes to see a bigger uptake of aspirational Africans in the corporate environment. Thabi was a columnist for the Business Times. She writes for the Business Day, Money Marketing and global publications such as Into Africa which is a publication that looks at capital markets on the African continent and BricsPost. Thabi is a Financial Mail rated economist. She was identified as a Change Maker in 2017. She was named the Economist of the Year by Absip in 2017. Thabi has a PhD and a MSc in Economics from the London School of Economics. She holds a MA in International Economics from Wits University, an honours in Economics and BA from Wits University.